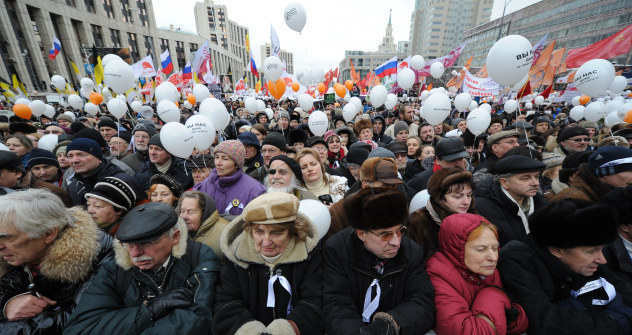 Thousands rally in Moscow to demand that the results of the 2011 State Duma elections be cancelled and Vladimir Churov, head of Central Election Commission, be dismissed. The Dec. 24 demonstration on Academic Sakharov Prospect in Moscow showed that the number of Russians interested in participating in civil society is growing – and that they are growing more frustrated with the actions of the authorities. The number of people who actually attended was up for debate. Official figures numbered the protestors at 29,000 while organizers claimed that 120,000 came out to listen to such prominent opposition figures as former Finance Minister Alexei Kudrin, presidential candidate and billionaire Mikhail Prokhorov, opposition politician and co-funder of the People’s Freedom Party Boris Nemtsov, anti-corruption campaigner and blogger Alexei Navalny, and TV host Ksenia Sobchak. Some officials doubted that the protest site could hold 120,000 people, but prominent blogger and independent observer Alexei Morozov who attended the demonstration said that the figure was accurate. Although the actual number of attendees may never be known, it was clear that these protests attracted more people than the previous ones on Dec. 5-7. Yet despite the crowds, the demonstrations were peaceful, and there were no arrests. Some participants argued that the rally was so calm because the attendees were a mix of journalists, professors, students, musicians and businessmen. Others attributed the lack of violence to the fact that the protest area was extremely overcrowded and it was tremendously difficult to get through the crowd. Saturday’s protests proved that more Russians express their discontent with the authorities and vote fraud.